The 82km Heaphy Track is one of New Zealands nine ‘Great Walks’, located at the top of the South Island in Kahurangi National Park. Every year, thousands of people make the trek across some of the most diverse terrain in New Zealand, from beech forest, to Alpine scrub, to the rugged West coast. So of course, we had to unicycle it, because if it was a great walk, it had to be a great ride! The idea formed when I was contacted by the National History Unit, who were doing a documentary on National Parks in NZ. Fast forward several months, and five unicyclists were ready to tackle the Heaphy Track on their unicycles. The park was open to cyclists for a trial period of three years, during the winter off-peak walking season. We met up in Nelson, a city at the top of the South Island, with Sean and John flying from Brisbane, and John and I flying in from the North Island. We were picked up by Rachel, a local unicyclist who I hadn’t seen since our last adventure on the Queen Charlotte Track 7yrs earlier! 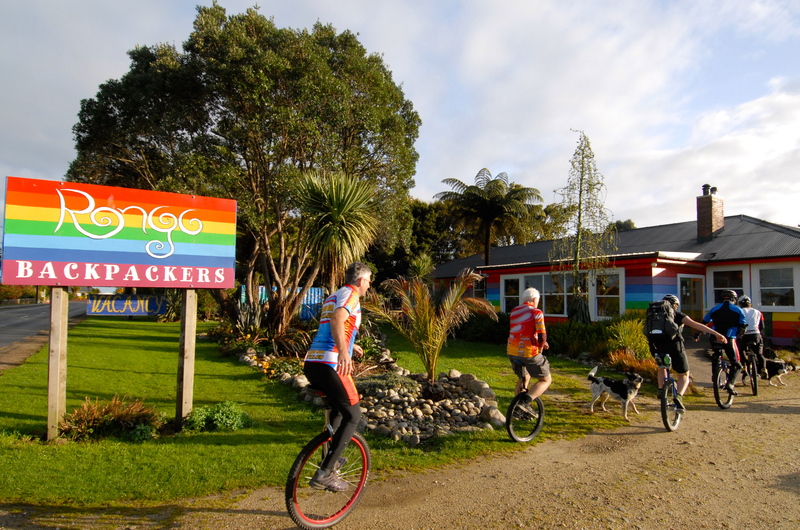 After packing our unicycles into the van, we drove to Karamea, a small town on the West Coast. The 5 1/2hr drive was scenic, but we were glad to stretch our legs when we got there. The psychedelically coloured Rongo Backpackers where we stayed was like finding Kermit the Frog in Bilbo Baggins’ hobbit hole. It stood out in the drizzly West Coast town like a rainbow, literally. We had to rub our eyes a few times before we walking in. As if Mother Nature was in agreement, a rainbow appeared, arching over our accommodation. We left bright and early the next morning. The rain had cleared, so we were happy that the start of our ride would be warm and sunny. After the obligatory ‘before’ pictures, we headed onto the track. The first section of the Heaphy was easy singletrack, as we started our ride from the West (most people attempt it in the opposite direction). It twisted and turned through low lying forest, punctuated by various swing-bridges, before hitting the coast. It was chance for many photo ops, although not a good idea to stop for too long, John found out. After casually stripping down as the weather warmed, he found himself feeding the local sand-fly population. We meandered along the coast until we reached Heaphy Hut, at which time we realised we were running behind schedule. Being winter, we needed to get to our hut before sunset at 5pm. With the heavy packs, it had taken us longer than we expected, and we still had a 700m climb ahead of us! After a quick lunch at the river mouth, we raced up the Heaphy River for about 8km, crossing more swing bridges along the way, and startling the occasional mountainbiker. We topped up our water supplies at Lewis Hut, before the long hike up the hill. The never ending climb and heavy packs took their toll, and we found ourselves still a few kms from the top as the sun went down. Fortunately we had some powerful LED lights and Sean’s rendition of Elvis to keep us going. When we arrived at the summit, it was at one of the busier huts- the James McKay Hut. Our destination was Saxon Hut, but due to (my) miscalculation, we didn’t realise it was still a full 10km away, so we decided to attempt to stay at McKay Hut for the night. Despite being full of mountainbikers, there was still room for five cold and tired unicyclists. We were greeted by some friendly two wheel folk who shared their food as well as accommodation. The next morning we were up much earlier, hoping not to get caught in the dark and to beat the forecast storm that was due to hit in the afternoon. The first section went along an alpine tussock area, and we had to be careful to avoid the many wheel sucking bogs which appeared along the track. It was the prettiest section of the Heaphy, with low lying scrub and crisp mountain air. We arrived at Saxon Hut (our original destination for the night) after of two hours of hard riding, so we were glad not to have attempted it last night. It was disappointing not to stay there- it was by far the nicest hut, set like an island in the midst of a tussock plain. John brewed us up a steaming pot of coffee which warmed us up before heading back on the track. The Heaphy continued to climb gently along the ridge. We came across a small forest in the Gowland Downs area that looked like something out of a fairy tale. It was a moss covered, fern lined oasis of trees could easily be the setting for Snow White and the Seven dwarves. We stopped briefly for another hot cuppa at Perry Hut, before beginning the descent to Brown Hut, our destination for the night. This was the most fun part of the track, as we could forget the weight on our packs as we blasted down the hill. It was getting dark when we arrived at Brown Hut, but the last few kilometres made it worthwhile. The film crew from the Natural History Unit met up with us at the bottom, and congratulated us on what was one of the toughest Muni rides we’d ever attempted. Hopefully, it will show people what unicyclists are capable of when the National Parks documentary series comes out. This entry was posted in Business, Department of Conservation, DOC, Environment, Heaphy Track, Humor, Humour, Kahurangi National Park, Karamea, Mountain Biking, MTB, Photography, Travel, West Coast and tagged Heaphy Track, Kahurangi National Park, karamea, Rongo Backpackers, Unicycle, West Coast. Bookmark the permalink.